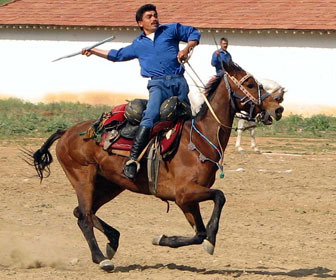 Jereed (cirit)is a customary sport in Turkey. It was an outdoor game on horseback in which the goal of the game is to make points by tossing a blunt wooden javelin at the rival team’s horsemen. Jereed is an essential sporting and ceremonial game that was brought from Central Asia to Anatolia for the duration of westward migration in the start of the 11th century. And in 16th century, it became as a war game by the Ottoman Turks. Then the game continued to became popular to all parts of the empire as an important Ottoman war game. It was also played to improve the cavalry attack and defense skills of the Ottoman armies. But in 1826, Mahmut II forbids Jereed for its condition as a risky game. Today, Jereed game is not as popular as it once was. It was continue to play only on the occasions of weddings and holidays. This sport is a contest that shows off bravery in all corners of Turkey. Cultural folkloric societies are attempting to keep this traditional sport alive by organizing local tournaments. 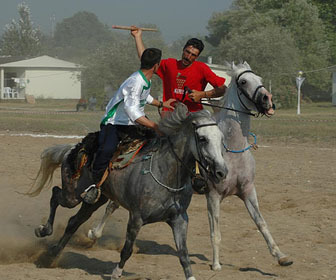 This traditional game is still active in the country of Iran, Afghanistan, Turkmenistan and other Asian countries inhabited by people with Turkish origin. Jereed is a way of developing equestrian skills that involves two teams of horsemen; each was equipped with dried poplar stick. These sticks are 70-100cm long and 2-3cm in diameter with rounded ends. Originally, these sticks were heavier and thicker but to lessen the risk of injured players they now prefer sticks made up of poplar wood which is lighter when it was dried. The two teams were line up facing one another on the field; each player has a distance of about 100 meters from the next player. Jereed players were dressed in regional costumes and mount their horses. The cavub signals the start of the game and introduces each player to the spectators with words of praise. By tradition, at the start of the game the youngest rider will be the one to trot in the direction of the opposing team. At the distance of 10-15meters, he tosses his jereed stick at one of the players. Concurrently, he turns his horse back and tries to reach the safety of his own side, chased by the other player with a stick on his hand. The essence of the game is to chase and flee while trying to hit an opponent with a stick. This game really requires skills and sportsmanship. 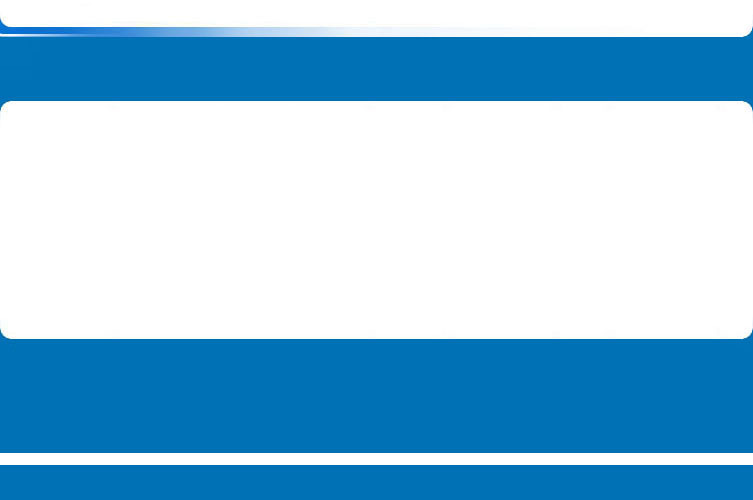 If the player hit the horse instead of the rider is against the rule and a sign of inexperienced player so the offender is automatically sent off the field. The referees of the game are also a former jereed players will count the numbers of hits and at the end of the game will declare the winning team. Well-trained jereed players seldom failed in hitting an opponent and are also skilled to prevent the hits themselves by bending low, suspending down from one side of the horse and other acts of acrobacy. Part of the skill rests in training the horses so they can play their significant role in the conclusion of the game. The two teams have a traditional etiquette formation. Care should always take into consideration not to put players in bad terms in opposing teams and players who show deliberately aggressive behavior during a match will be blacklisted. After the jereed game, the organizers of the said event will host dinner and give the awards to the victorious team. In this game, if the player dies in the field, he will be deemed to lose his life in a battle as a sacrificial victim and his relatives do not take legal action against the player unless the public case is set off by court and a legal trial is done. For that reason, before the game starts if they are known aggression between the players they can be thrown out of the tournament or they can be submitted to the same team by the elder people of the locality or by the referees. Jereed matches strike like lighting, played by riders who rush toward each other in clouds of dust, hauling wooden javelins. Jereed players are heroic figures that can be also compared to the owners of the fighting owners at least in their own way of thinking. The popularity of this game represents the determination of the Turks not to lose their renowned distinctiveness. Today, rules of the game were modified and an official federation was founded and University of Erzincan began offering formal training for this kind of sports for hopeful players. Though there were those times that Turks have forgotten to ride toward the victory of Jereed, now they are learning to enjoy this game again.